Be sure to check in and see if you were one of this week’s release winners December Release Winner Page! Remember the days of thumbing through your favorite magazine, all the beautiful pictures and inspiration? Well, grab your cup of tea or your favorite mug of java and get cozy! With Papertrey Ink’s new look book, you can now find exactly what you’re looking for. All of our new and beautiful products are in one place making it fast and easy to find just the right thing to make cards for every occasion. Take your time to peruse everything, or quickly page through to get an overview of what’s new. Don’t forget to check out all the fantastic projects created by the top designers in the industry. With all that inspiration, you’re sure to find something you can’t wait to make. Our new look book is such a great way to enjoy each release and to get a good look at all of the sophisticated and trendy designs that Papertrey Ink has to offer. Don’t forget, you can click project images to visit blog posts. The look book features links to shop the products now includes a bookmark feature as well. You have until 9:30pm ET today, December 15th to post a comment and be eligible to win. Only one comment per person please. 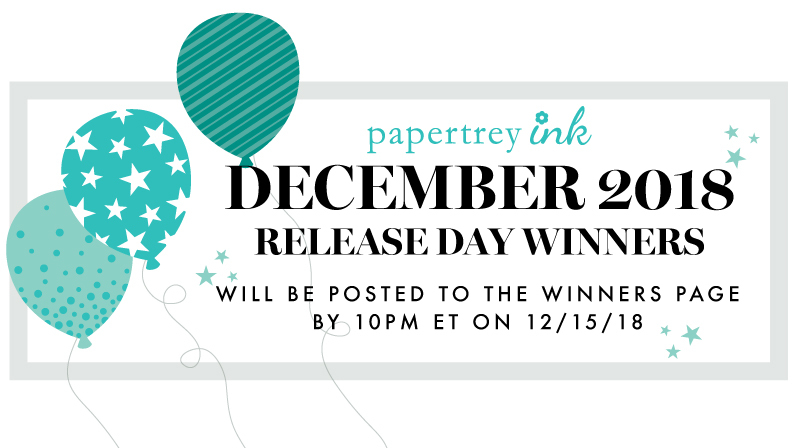 One randomly selected winner will be announced on our December Release Winner Page by 10pm ET, today, December 15th. Thanks for joining in our release festivities today and best of luck with the contest! Your Beautiful Birthday – December Free Stamp Set! My favorite love story movie is Riders of the Purple Sage. The Way We Were with Streisand and Redford. There are so many great romance movies to choose from! I’m having a hard time deciding, but I will say Sense and Sensibility (the version with Emma Thompson). My favorite motion picture love story is Sleepless in Seattle! A classic….”Gone With the Wind”. I watched An Officer and a Gentleman over and over when my husband was in basic training. It will always be one of many favorites. The Last Holiday is my favourite, it’s funny but also a love story. So many good movies have already been mentioned-I thought I’d add to the list by saying Steel Magnolias. I would have to say Gone with the Wind, but it’s a tough choice! Ooo, tough question! I’d say it’s a toss-up between Pretty Woman and Somewhere in Time. The later having been filmed in my old stomping grounds of Mackinaw Island, MI. It had such beautiful scenery. I love all the variations of love in Love Actually! There are several that I have seen multiple times…….Pretty Woman and An Officer and a Gentleman…must be something about Richard Gere. The Valley of Decision. Great movie and also great book. 2nd choice would be Green Dolphin Street. Tough question but I do love Gone With The Wind! Hard to choose, Titanic and Ghost. The Notebook gets me every time. Since the question doesn’t specifically say what kind of love story, I have to say Mr. Holland’s Opus. The love he had for his son, for his students, and for his music still gets me every time I watch that movie! My all time favorite would be Somewhere in Time. Tragic story but beautiful romance. Hard to choose, but Pretty Woman has always been a favorite! Somewhere In Time is still my favorite. Fifty First Dates. Yeah it’s silly but the idea of getting someone to fall in love with you over and over and over … is so sweet.. So many to pick from, but I’ll say the classic Gone With the Wind. My favorite love story has been When Harry Met Sally for a long long time… thanks for the chance! Beautiful release!! There are so many wonderful love story movies out there. I have always loved the old black and white classics and one that I adore is Now Voyager with Bette Davis. Fantastic love story. Cheers. I agree, it’s an amazing movie. Bette never looked so BEAUTIFUL too. Good choice. SABRINA (The original version). This film is very dear to my heart. I’m from the South and there are lots of good love stories from the south, but I’m especially partial to SWEET HOME ALABAMA! An Affair To Remember….a romance classic with Cary Grant and Deborah Kerr. My favorite is You’ve Got Mail! The Notebook – my favorite romance movie but it’s hard to beat Hallmark movies curled up in bed early just to enjoy the cold weather and warm bed. The photography does remind me of gorgeous holiday cards and I admit to be inspired by the scenes. Love Affair and An Affair to Remember are my favorites. If you force me to choose between the two, I guess Cary Grant wins. I saw someone else post Random Harvest. That’s also a great movie. You’ve Got Mail, Sleepless in Seattle and Pretty Woman. If I’m scrolling down the tv menu and see one of these three I’ll usually stop to watch it. My favorite love story movie is Pretty Woman! There are several, but if I choose one, I would have to say Ghost, with Patrick Swayze and Demi Moore! I love any happy love story movies and am currently enjoying all the wonderful Hallmark movies!! Sense and Sensibility! Two wonderful love stories! I could watch it every day. That’s a tough one, but I think You’ve Got Mail is my favorite. I love watching The Princess Bride. And another favorite is Galaxy Quest. Both are very funny stories built on love, loyalty, and friendship. I have to say my favorite all time love story is Pretty Woman. It’s more than a single love story- that’s the point of it. I’ve got to sit down, work on Christmas cards, and watch Love Actually. My favorite is popular at this time of year–It’s a Wonderful Life. This is definitely a hard question to answer. If I had to chose one, I would say Moulin Rouge. I love a great musical, and when added with a love story, it makes it even better. It’s one of those movies that you know what happens at the beginning, but the characters story draws you in. Pride and Prejudice is a favorite. I guess my favorite Christmas love story is an old Hallmark movie, “The Most Wonderful Time of the Year” with Henry Winkler. When Harry Met Sally. It is the movie my husband and I went to see the day before he proposed. Love Story is my favorite tear jerker! Ghost is at the top of my list. and Moonstruck with Cher and Nicholas Cage. Sound of Music. An unlikely love in a tragic time that saved not only a couple but a family. My favorite love story is Pretty in Pink. You’ve got mail! One of the classics – even with outdated technology it never gets old. The one that immediately came to mine was Casablanca. Love sometimes means sacrifice. I love You’ve got mail! It’s timeless. Thanks to the whole team for all the inspiring cards and projects! Somewhere in Time with Jane Seymour and Christopher Reeve! Watch it!! My favorite movies are Ghost and Pretty woman! That would have to be Sleepless in Seattle since it was hubby & I’s first date. Dirty Dancing, but at this time of year I always watch The Holiday. There have been so many great choices in every ones comments. I have two favorites, The Way We Were and Out of Africa. Good music in both, too! It’s hard to pick a favorite out of so many wonderful love stories. One that I enjoyed a lot was Groundhog Day. I’d have to say An Officer & a Gentleman and Moonstruck are tied – both have outstanding endings! My favorite is Pride and Prejudice. You’ve Got Mail, Pretty Woman and Return to Me. Watched them all countless times! Wow! So many amazing new goodies this month and thank you for all the gorgeous DT inspiration! Favourite motion picture love story is most definitely “Love, Actually” and it must be watched every Christmas without fail! An impossible choice. Crossing Delancy, An Affair to Remember, Gone with the Wind, Sleepless in Seattle, While you were Sleeping. There are several more. Thanks for the chance to win an amazing prize. Love all the new products. Merry Christmas. Hands down it would be Up Close and Personal with Robert Redford and Michelle Pfeiffer. That movie makes my heart both smile and cry. My favorite romantic Motion Picture is Bodyguard. Also Ghost and Titanic. Thank you, PTI for a fabulous Release. Happy Holidays!!! Princess Bride and You’ve Got Mail. For older movies, The Philadelphia Story with Cary Grant and Audrey Hepburn is good. Hmmm at first I thought An Affair To Remember, but on second thought I would have to say my most favorite would have to be The Holiday. We actually did a house swap with a British couple one year, we swapped our Cape Cod house for their sweet little bungalow in Conwy Wales….it was magical! Merry Merry! It’s a toss up between Emma and Pride and Prejudice. It must really be a love for Jane Austin and period romances though! Great products this month! Goodness – I guess I had favorites in different times of my life – Love Story, An Officer and a Gentlemen, Sleepy in Seattle, Ghost – just to name a few I’ve loved! So many… One Fine Day, The Family Stone, Love Actually, Steel Magnolias, Titanic and the list goes on!! I must say that Steel Magnolias and Love Actually were the first that popped into my head, but then I thought of Pretty Woman, an Officer and a Gentleman, And Sleepless in Seattle. That reminded me of An Affair to Remember, then Gone with the Wind… ok. Stopping now to go watch movies! I really like Love Actually with all the little vignettes that mix together. While You Were Sleeping! Love the setting, love the actors, love the ending. I would have to say Pretty Woman and Steel Magnolias. Thanks PTI for another great release!! Hands down – When Harry Met Sally. My favorite! I love the Pretty Woman!!! Thank you for the chance! You’ve Got Mail, I love Tom Hanks and Meg Ryan together. I love Anne and Gilbert. “How to Lose a Guy in 10 Days” is one of my favorite motion picture love stories. The Sound of Music…all time favorite! I would have to say Gone With The Wind! There are so many good ones, but my favorites are Love Actually and While You Were Sleeping! This is SUCH A FABULOUS RELEASE, Ladies! 😉 My favorite motion picture love story is: Sense & Sensibility! Someone who is so idealistic & dreamy about love, & finds out love isn’t like what she thought at all…. And in the end, finds true love! The Sound of Music, love Julie Andrews! So many choices, so little time….. I guess if I have to narrow it down, it would be Dances With Wolves. So many layers and so many different kinds of love. Plus, Keven Costner…..
wonderful release – long wish list! my favorite love story is “Pretty Woman” – love Julia Roberts in that movie. also love “Sleepless in Seattle”. I would have to say Moonstruck because it’s my husband’s favourite, which is kind of romantic. Also for the music, for the atmosphere, for Cher and Olympia Dukakis. NOT for Nicholas Cage, one of my least favourite actors. My favorite is out of Africa. Don’t ask me why but it always has been since I was a kid. Jane Austen anything… Pride and Predjudice, Emma, Sense and Sensibility. Love anything with Tom Hanks and Meg Ryan! The Notebook–a love that weathers the test of time and decay. I just love a love story…there is never enough of those! Now I do like the happy ending, but Ghost just …oh sigh! So many good ones to choose from but I will go with Sabrina – the version with Harrison Ford. My favorite love story: Love Actually with Gerard Butler and Hillary Swank. Oh my this is a super hard question to answer as I am a big time romantic movie buff and have so many. If I listed them all I’d be here forever plus you didnt ask for my entire list, lol, so I will say The Notebook is one of my top favorites for sure, Dear John is another, and I know this is an odd one but Dirty Dancing ranks up at the top of my list too. Awesome release by the way! So many wonderful products that I can’t wait to get my hands on! I didn’t realize it until the final credits rolled, but Forrest Gump is hands down the sweetest love story of all time for me. This is tough. I’m going with Crossing Delancy. Jake and Sam from Sixteen Candles! This is so basic, but The Notebook is my favorite! Roman Holiday with Audrey Hepburn and Gregory Peck. She was so sweet, he was so handsome! Ooh my favorite romance movie… that’s a hard one Becki love so many but the one I watch at least once a year is Pride and Pedjuice 2005 movie with Keira Kinghtley… sigh I’ve seen it over 8 times. Great Release! Amazing actually. Like many others, one of my favorite romance movies is, “Sleepless in Seattle”. Very moving. Thank you for another great release as always! Definitely have to be the classic, The Sound of music! I love a good musical! Sound of Music. I never get tired of watching it. I love lots of old classic movies (like An Affair to Remember with Cary Grant and Deborah Kerr), but the most-watched is the 1995 BBC version of Pride and Prejudice with Colin Firth and Jennifer Ehle. Our daughter watched it so much as a kid that our son knew the dialogue by heart although he had never actually watched it! Thanks for the chance to win a fabulous gift certificate for this great release. Wow, that’s a hard (and fun!) question. I suppose a three-way tie between Affair to Remember (Cary Grant), Sense and Sensibility (Hugh Grant) and North and South (British title, Richard Armitage). I’m going to say an old classic…Sound of Music! My favorite Motion Picture Love Story would have to be Notting Hill. I watch it over and over! Easy: The Sound of Music, since 1965! Second: Emma, 2009. Third: Pride and Prejudice 1995. Notting Hill is my favorite😊. Pretty Woman would be my favorite but followed closely by Sleepless in Seattle, Love Story, You’ve Got Mail and of course, The Sound of Music. When Harry Met Sally is my fav. Haven’t seen it for a long time though! “Somewhere in Time” with Jane Seymour and Christopher Reeves…and the soundtrack is also one of my all-time favorites! Thanks for the wonderful inspiration shared with the new products. I really like The Fifth Element and the more recent Brooklyn. I love movies with lots of romance. Two that come to mind are “An Affair to Remember” and “Gone with the Wind”. They are certainly tearjerkers too! Super tough question. I could easily list 25 favourite love story films… if I had to pick one, I would put “A Very Long Engagement” with Audrey Tautou at the top of my list. I could watch The Notebook every day! The Notebook is so touching; it is a story of true love. The Scarlet Pimpernel is our current favorite. Somewhere in Time will always be number 1. What a fun release. I’ll be looking at the projects to get inspiration for weeks! When Harry Met Sally has got to be one at the top of my list. Also love Out of Africa. And one that wasn’t a “movie” but a mini-series, Lonesome Dove. For sure it is an all time favorite! The Notebook is an example of true love and makes me teary every time I watch it. I’m going a classic musical…Singing in the Rain! Since it’s Christmas time, I love White Christmas. The Notebook, I cry every time. So many wonderful movies have been mentioned and there are some that I haven’t seen so Thanks, ladies! This is my favorite movie genre so tough choice. I have always loved Dustin Hoffman and Johnny Depp so i have seen Tootsie and The Graduate along with What’s Eating Gilbert Grape and Edward Scissorhands multiple times. But I wodd have to say Moonstruck and 16 Candles are my favorites. Beautiful release and thanks for the chance PTI! Hmmmmm… I’d have to vote for “Sleepless in Seattle”. The Sound of Music would be my all time favourite. Hard to choose, but a movie I never tire of, is Sleepless in Seattle. My favorite love story is Bridges of Madison County. I’ve watched it SO many times that I can cry from the first scene. But I also love many of the others that have been mentioned. Hands down, my favorite love-story movie is The Notebook! My favorite is The Notebook, I need to go watch it now! Without a doubt, my favorite is Sleepless in Seattle. From all the comments, it appears to be an all-round favorite. Sleepless in Seattle is a favorite. Can’t decide between Sleepless in Seattle (comedy) or The Notebook (serious). Can I have 2 favorites? Always, with Holly Hunter and Richard Dreyfus, or maybe The Goodbye Girl, with Marsha Mason. Also always loved Romancing the Stone. This is my favorite movie genre so tough choice. I have always loved Dustin Hoffman and Johnny Depp so i have seen Tootsie and The Graduate along with What’s Eating Gilbert Grape and Edward Scissorhands multiple times. But I wodd have to say Moonstruck and 16 Candles are my favorites. Being it’s the holiday season, I would have to say my favorite romance movie is The Proposal with Sandra Bullock and Ryan Reynolds. I watch it every year. One of my favorites is Sleepless in Seattle. I love all the new products! Thanks to the designers for the great designs and Happy Holidays to all of you. Sense and Sensibility with Emma Thompson. It’s the only movie I saw more than twice at the theater. Saw it first with my book group, then with my husband, then took my daughter, then my mother. And now I own it. Yep, it’s a fave. “Pride & Prejudice” — BBC version w Colin Firth. “Pride & Prejudice” — version w Colin Firth. That’s an easy one…Hands down my favourite is The Lake House … love it!! Bridges of Madison County is one of the most romantic movies ever, and I also go to the other end of the spectrum with anything Cary Grant/Katherine Hepburn. Merry Christmas to all of the PTI team and thank you for the hard work and beautiful projects, especially at this frantic time of year! Notting Hill is one of my favorites because it has a lot of humor and a sweet ending! Wishing you all a very Merry Christmas and Happy New Year!! Ah my ga! It is a toss up between Love Affair, Serendipity, and Pride and Prejudice. Love them all. Oh boy can’t forget A Lot Like Love – oh yeah and Notting Hill. So many! My fave motion picture love stories are Notting Hill and Silver Linings Playbook. And lots of many others!!! Wow, this is an oldie. The Enchanted Cottage with Robert Young and Dorothy McGuire. It’s a black and white movie about a plain woman and a disfigured, wounded soldier who are beautiful in each others eyes. Two Weeks Notice…….hahaha, guess I like a few! Gone with the Wind… hahaha, loks like i like a few! So sorry, please delete duplicate post. It didn’t look like it went through the first time. While You Were Sleeping is my favorite. A love story and comedy all thrown together! My favourite love story movie is Much Ado About Nothing with Emma Thompson. Gets me every time! My first reaction was that this is a difficult question to answer with all of the amazing options. After that, Gone With the Wind came to mind. It is both a sweeping story and a sweeping movie filled with so many memorable scenes and a number of different love stories. But immediately after that, Something’s Gotta Give came to mind, a completely different type of movie. I adore its humor and music and the slowly evolving love between the two main characters. It definitely doesn’t have the grandeur of Gone With the Wind, but Something’s Gotta Give is compelling nonetheless. My favorite movie is Ever After! “Sabrina” with Harrison Ford and Julia Ormond – definitely! My favorite love story is Sleepless in Seattle. Awesome release! You’ve Got Mail is my favorite! I never get tired of watching it! Tough decision but I’d have to say Sleepless in Seattle. The French film Amelie- such a fairytale. I think Pretty Woman is my favorite. However Sleepless in Seattle comes in second. My favorite: The African Queen with Bogart and Hepburn. I have to say it is a tie between Sabrina and Princess Bride! I’m an action buff so I’m going with True Lies. Another incredible release! My favorite movie love story is The Princess Bride – “Death cannot stop True Love, all it can do is delay it for a while”. I love the Thornbirds and have seen it many times! Silly question… Love Story is the only great love story ever told! I love “love actually”. I have the DVD and love to show it to people that have never seen it. I love While You Were Sleeping …and Overboard :)! There are way to many to just pick one. This time of year I love watching Hallmark movies and could watch one everyday!! Hubby & I are huge fans of the movie Always. We don’t understand why it didn’t get more acclaim–great movie! Love “An Affair to Remember”. I tear up every time! actually the one with the question’s name Love Story ranks up there with me. It might have been just the time of life for my hubby and me as we had just met but it has wonderful memories with it. We have been married for nearly 51 years!! I’m going with White Christmas because we watch it every year. Great release! Mine is either Pretty Woman ( the modern day Cinderella story) or An Officer and an Gentleman (saw it on my first date with my husband)! They both star Richard Gere! Gosh, so many good ones how could I possibly choose just one? Here are my top in no particular order: Somewhere in Time, Gone with the Wind, The Notebook, Love Story, Ghost and Out of Africa. I love some of the lines in A Walk To Remember, and also in You’ve Got Mail- so it is a toss up for me. That’s an easy one for me. My favorite is You’ve Got Mail. Love the books, the seasons, the actors and the love story! My favorite motion picture love story is While You Were Sleeping! There are sooooo many great ones, it’s hard to choose. A few of my faves are Love Actually, Pretty Woman, The Notebook, About Time, and Delivery Man. LOVE this release!! The inspiration from everyone is amazing!! I have so many favorites, but Pretty in Pink would have to be my top pick!! So many to choose from! I would say The Notebook. Favorite love story? Wow that’s a tough one as there are so many. I love Pride and Prejudice with Colin Firth. It’s tough to beat Jane Austin. For a more contemporary story I’d say it’s Sleepless in Seattle. One you’ve probably never heard of, but it’s also a murder mastery (LOVE! ), Laura. Set in the 40’s, the detective investigating her murder, falls in love with her portrait. And of course it gets into personalities and motives, and, no more, rent it and watch it! My favourite is “Dirty Dancing” – maybe because I’ve seen it in my teenage years, I’ve always kept it in my mind. This is such a tough questions. I’d have to say When Harry Met Sally. And, now I want to watch it again this week. Can’t beat a good comedy – Overboard – Kurt Russell and Goldie Hawn – such a great movie! Ghost. Great release- thank you for the chance to win! The Scarlet Pimpernal, a 1940’s movie. Although they don’t necessarily have happy endings, I really love “A Star Is Born” and “The Way We Were”. I think this question is like asking me to pick a favorite child (or stamp set), it just isn’t possible. I *think* I’m going to say While You Were Sleeping, but in five minutes I would probably have a different answer. My FAVORITE Motion Picture Love Story’s would have to be Titanic and Pearl Harbor!! THANKS for sharing and for the chances to WIN!! Charlize Theron and Keanu Reeves in “Sweet November”. Sigh. My FAVORITE LOVE Story’s would be Titanic and Pearl Harbor!! THANKS for sharing and have a FABULOUS Weekend!! Oh my, Kate & Leopold with Hugh Jackman & Meg Ryan is my all time favorite! I’d have to say that my favorite is Somewhere in Time, maybe because it was shot on Mackinac Island which I love! The first one that popped into my head is Anne Shirley and Gilbert Blythe. But there are so many others! My fav is Australia. I love the story but also the historical setting. Maybe my answer is being influenced by the season, but today I’d say It’s a Wonderful Life. Definitely Somewhere in Time. What a beautiful love story. It’s hard to pick a favorite, but I love Philadelphia Story, Breakfast at Tiffany’s and While you were Sleeping. I can watch them over and over again. The first one I thought of was The Princess Bride, a true classic filled with humour, adventure and of course true love! My favorite would be Dirty Dancing. My favorite love story is Somewhere In Time with Jane Seymour and Christopher Reeve. Still my 2nd favorite movie of all time! Well Anne of Green Gables is probably my favorite, but I don’t know that it’s considered a motion picture since it was only released on television. For movie motion pictures it’s probably The Notebook. I really liked Sleepless In Seattle. I’ve watched it a few times. “Bridget Jones Diary 1” is my all time favorite love story!!! I am not sure if this is included as motion pictures, but all the Disney love stories are adorable. I loved watching Titanic, when it first came out years ago. Such a great movie. Hmmm…would have to say An Affair to Remember. I love that movie – could watch it again and again, lol. Still love Pretty Woman after all these years! I have so many that would qualify for this question… The Sound of Music, Me Before You, The Last Holiday to name a few. Thanks PTI! Great question! So many fun movies I need to check out. One of my favorite love stories is The Goodbye Girl. Sleepless in Seattle has always been a favorite of mine. What a great release! My must-have list is…lengthy – HA!! My favorite love story….oh that’s a tough one…I’ll repeat what so many others have posted…Notting Hill, While You Were Sleeping, You’ve Got Mail, Ghost, titanic, Pretty Woman, The Sound of Music….and more!! Thank you for the chance to win! One of my favorite love stories is still Rose & Jack in Titanic. Does it matter that he dies in the end?!? My favorite love story is Braveheart, I can watch it over and over. Sleepless in Seattle and When Harry Met Sally… two of the best movies ever! The Sound of Music…I love the scene in which the Captain and Maria are dancing and she blushes. I love the movie Roman Holiday. Gregory, Audrey and Rome, a perfect combination. I tear up at the end very single time. I like Notting Hill, Mannequin and White Palace. But lots of others listed are great too!! I love the old musicals full of love and life. An American in Paris, On the Town, White Christmas, Singin’ in the Rain, Swing Time… But my favorite is There’s No Business like Show Business. I just love Donald O’Connor and Marylin Monroe. And now, I will be humming and tap dancing all over the house today! I have always loved Dustin Hoffman and Johnny Depp so i have seen Tootsie and The Graduate along with What’s Eating Gilbert Grape and Edward Scissorhands multiple times. But I wodd have to say Moonstruck and 16 Candles are my favorites. My absolute favorite movie is Disney’s Beauty & the Beast, but my second favorite is Sabrina, the remake version with Harrison Ford and Julia Ormond. It’s been a fun release, Happy Holidays to the entire PTI Team!! It has to be You’ve Got Mail! I love that movie! I don’t watch movies so don’t know any. Greatest love story is God’s love for us. Bridges over Madison County. It was a tear jerker. The Inheritance is one I love to watch. Oh so many movies, as I am a sucker for a movie love story! My favorite is “An Affair to Remember” with Cary Grant and Deborah Kerr. There are a few I like, but my top ones would be Ever After, Never Been Kissed and Two Weeks Notice. Just because it’s the holidays…I love, “The Holiday” with Cameron Diaz! No contest – Move Over, Darling with Doris Day and James Garner. I like my love stories to keep me smiling throughout. Second choice would have to be Auntie Mame with Rosalind Russell. What a great question! I would say Titanic is my fave. Definitely Roman Holiday with Audrey Hepburn and Gregory Peck.Breaks my heart every time. Great snapshot of Rpme circa 1950.is there anyone more handsome than Gregory Peck? Definitely Roman Holiday with Audrey Hepburn and Gregory Peck. Breaks my heart every time. Great snapshot of Rome circa 1950. Is there anyone more handsome than Gregory Peck? There are so many that I have really, really liked, but I am going to have to go with Steel Magnolias. This is like picking a favorite child! I’ll go with the first one that popped in my head and that is Truly, Madly, Deeply with Alan Rickman and Juliet Stevenson. For a Christmas movie I like The Holiday. For a classic, Sense and Sensibility and for a little cutie movie, Leap Year!! An Officer and a Gentleman and An Affair to Remember. I love Sense and Sensibility, two love stories in one. Super hard question because I love so many!! I really loved An Officer and a Gentleman and I LOVE this release! Thanks to you all for the spectacular eye candy! Is there any other type of movies besides romantic? My favourite is a walk to remember or les miserables. Too many to list, but one that immediately comes to mind because I love watching it with my sister is _While You Were Sleeping_ … so sweet and fun! Love Actually or The Notebook. My favorite movie love story is “You’ve Got Mail”. I can watch it over and over and never get tired of it! The newer “Pride and Prejudice” with Keira Knightly is a close second! My favs are Pretty Woman & An Officer and a Gentleman! Fabulous release! Thought I knew, until I started reading other comments. But my first thought was Funny Girl, followed by The Notebook. But, face it, I’m a sucker for a live story! Roman Holiday is at the top of the list. An oldie but a wonderful goodie, An Affair to Remember with Cary Grant and Deborah Kerr. You’ve Got Mail is one of my favorites. Legends of the Fall is my all-time favorite. Totally Romantic of a woman who at some time or another loves all 3 brothers. Love this Release, Thanks for the chance to win! Love Actually is my favorite. I like that it’s several different stories about love. I absolutely love The Princess Bride. I have watched it countless times and still find it immensely entertaining. A little romance and lots of humor! so so many good love stories but The Way We Were Always makes me stop and watch – and cry. Robert Redford at his yummiest. So hard to choose – I love romantic movies. I adore many of the ones mentioned already: Sound of Music, Notting Hill, Pretty Woman, Sleepless in Seattle, You’ve Got Mail, Serendipity, Bridges of Madison County, Sense and Sensibility. During the holiday season, I love watching Love Actually, which features many love stories of different kinds. Thanks for another wonderful release and have a Merry Christmas and Happy New Year! The Notebook is definitely one of my favorites! For pure rom-com romance, I would have to say Sleepless in Seattle! My favorite love story is “Far And Away” with a (very) young Tom Cruise and Nicole Kidman. Too many! Love Actually, Notting Hill, You’ve Got Mail. Many more in the days of Humphrey Bogart and Lauren Bacall, and yummy William Holden – I think I’d better go to Turner Movie Channel for more! My favorite love story is Pearl Harbor….i cant help it! It makes me cry every single time for so many reasons. Gone with the Wind would be my favorite but a close second is 8 Seconds! Love that movie! Cinderella and Ever After are a couple of my favorites! When or where ever Elvis Presley was in it, it was a favorite!!! Casablanca and Shadowlands are two of my favorites! I absolutely love your designs! My favorite Christmas movie is A Princess for Christmas. The happy ending is the best! Thanks for your emails – I look forward to them with every release. Congrats on a grade release! Gone with the Wind is such a classic. Love it. Thanks for the chance to win! Anythin love story with Reese Witherspoon! So many to choose from but would have to narrow it down to Dr. Zhivago with Ghost coming in a close second. Two very different movies but could watch them both over and over again! I just love “Dirty Dancing”. I have seen the movie first in 1986 when I was 14, and it’s still the first movie I watch on a long haul flight. The American President with Annette Benning. SO many wonderful movies, it’s not easy to choose. I’d say Love Actually (with all the different stories) is always a favourite, as is Notting Hill and An Affair to Remember! The Ghost and Mrs. Muir. Not the TV show, the movie from 1947 with Gene Tierney and Rex Harrison. I’ve seen it only once many years ago, it left that much of an impression on me. Bawled my eyes out and it was the most romantic movie I’d ever seen. My favorite is The Notebook. I used to love Ice Castles, too. Breakfast at Tiffany’s just because of Audrey Hepburn.